Can You Use Protein Shakes As a Meal Replacement? Protein Shakes Before or After a Workout for Weight Loss? Although meal replacement drinks contain copious amounts of protein, they are not the same thing as a protein shake. When you want a fast meal on the go, protein shakes may help in a pinch, but they are not designed for total nutrition as meal replacements are. Think of them as simply supplements that help increase the amount of protein in your daily diet. The protein supplement industry is big business dating back to the late 1930s when health food stores sold them as nutritional supplements. Protein powders rode especially high on the need for nonperishable goods during World War II. In the 1950s and 1960s, various kinds of protein shakes, using egg protein, milk and whey protein and soy, emerged as popular supplements in the fitness world. Since then, the main purpose of protein shakes has been to provide a quick fix of high-quality protein as part of recovery from a strenuous, muscle-pumping workout. They also help for people who aren’t accustomed to getting large of amounts of protein in their daily diet. Many protein shake producers also produce meal replacement drinks, however. Look for the words “meal replacement” on the label. Meal replacements have many applications. They supply nutrition to people who are seriously ill and cannot eat whole foods. They are widely used in medical weight-loss interventions to control the amount of calories you consume in a meal. Meal replacements are also commonly used among the elderly to ensure proper nutrition. "Nutrition" is a keyword. Meal replacements provide all of your required nutrients — carbohydrates, protein, fats, vitamins and minerals — in balance. If you want to consume one or more of your meals as a drink, it’s important to ensure that you aren’t malnourished in the process. 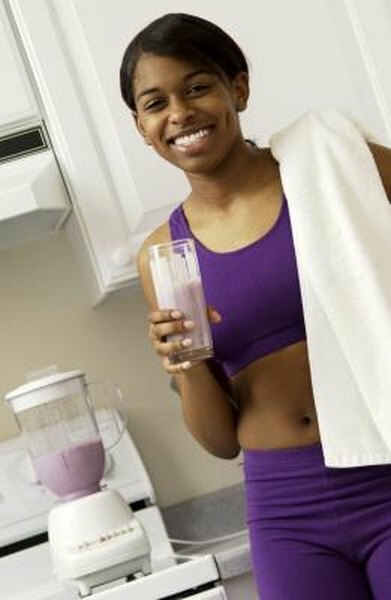 Although many protein shakes are fortified with vitamins and minerals, their main ingredient is of course, just protein. They are not designed for whole nutrition. In fact, many are deliberately low in carbohydrates and fats. This is because protein shakes are mainly the domain of muscle-building and weight-loss products, although to a lesser extent, the vegan/vegetarian market. Meal replacements also supply a small amount of essential fatty acids, a balance of omega-3 and omega-6 fats, for optimum nutrition. Carbohydrates are necessary to main your blood glucose levels between meals, prevent the loss of electrolytes and provide energy to your brain. If want to use a protein shake as a meal replacement to help you lose weight, you have better options. MayoClinic.com notes that although some protein shakes may claim that they can decrease body fat or promote weight loss, you miss out on the nutritional benefits of whole foods. In addition, since protein contains calories, consuming too much protein can hinder weight loss — especially if you drink protein shakes in addition to your usual diet. If you regularly replace meals with protein shakes, you may get more than 46 to 56 g of protein you need each day, but this isn't necessary for good health. Check the labels of the protein shakes in your health food store. Many have warnings the product is not designed for weight loss. Moreover, drinks don’t satisfy the same way as whole foods do. You’re more likely to get hungry later and consume more calories anyway after substituting a meal with a protein shake. Protein shakes and high-protein meal replacements often work best as temporary fixes. MayoClinic.com; I'm Trying to Lose Weight. Could Protein Shakes Help? ;;Katherine Zeratsky, R.D., L.D. ; Katherine Zeratsky, R.D., L.D. ShareCare.com: How Can I Plan a Healthy Meal in the Shortest Possible Time?